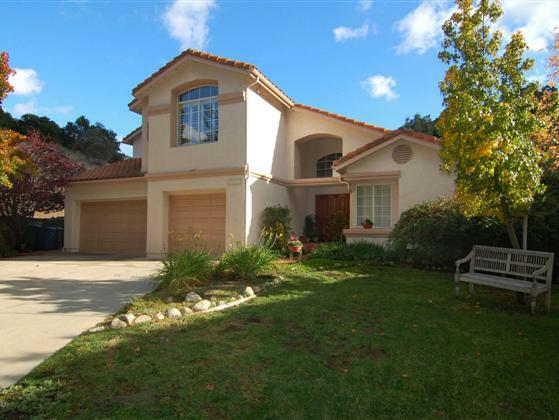 Located in a private cul de sac and adjacent to the open space of the Santa Monica Mountains this lovely 4 bedroom 4 bath Griffin Parkside home is now available. The double door entry spills into the breathtaking foyer, complete with tumbled travertine floors, and a view of the lovely dining and living rooms, as well as the rear yard, through floor to ceiling windows. The features of the lower level include a quaint guest bedroom suite, updated powder room, formal dining room with French doors to the rear patio, vaulted ceiling living room with wooden shutters, gorgeous hardwood floors and arches. The gourmet kitchen complete with custom cabinetry, stainless steel appliances and granite countertops, is open to the breakfast dining area as well as the family room with a fireplace. The downstairs bonus room serves as a playroom or office or storage area.The upstairs master suite has an oversized spa tub, separate shower, large closets, vaulted ceilings, and a private deck!